Most times when i make soy milk, i make it traditionally in my kitchen from scratch. Luckily for me, the soya bean seed is always readily available whenever i need it. It’s mostly used as a beverage which can be sweetened and served hot as tea for breakfast or cold. Please take note that soya bean milk and soya bean powder are totally different. Soy milk is the most nutritious and best protein source because it has well balanced amino acid levels than other vegetable sources. it’s rich in essential fatty acids, amino acids like lysine and methionine, fiber, vitamins and minerals. This is one drink which is highly essential for kids due to its nutritious benefits and can also be taken by diabetics. Step 2: Drain and rinse the seeds with clean water. 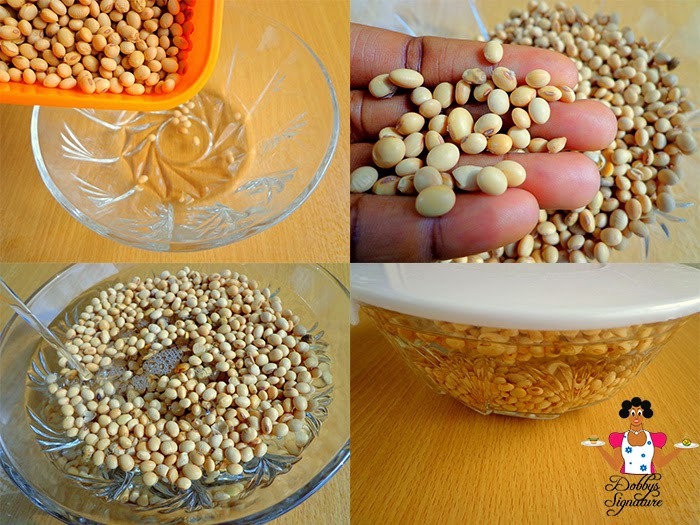 Rub the seeds between your hands to de-haul it till the skin removes(Just the same way beans is de-hauled for moi moi ). This process is very important as the skin is more of fiber and insoluble. Sieve out the chaff and rinse with clean water several times. 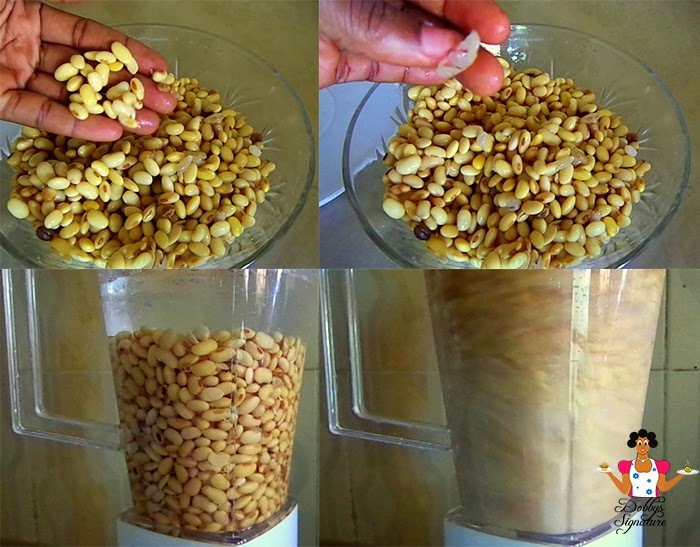 Pour the washed seeds into a blender, Add some water and blend till smooth. Step 3: Place the Sieve with handle on the pot and place the pap sieve cloth within. Gently pour the blended soya bean slurry into the pap sieve. Squeeze the Liquid filterate into the pot. 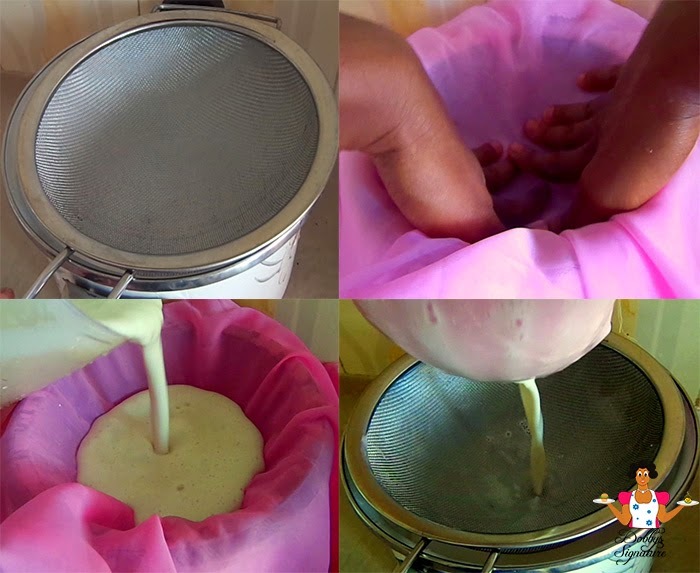 The chaff can be reused by placing in the blender again with water, blending and squeezing till all the milk is extracted. Step 4: Place the pot with the filtered soya milk on fire and cook on low heat for about 15-20mins till it starts to boil. While it cooks, keep stirring because it has the tendency to curdle if you don’t. Sieve once more (Hot filteration) to remove the insoluble soy pulp fiber (Okara)and leave to cool.